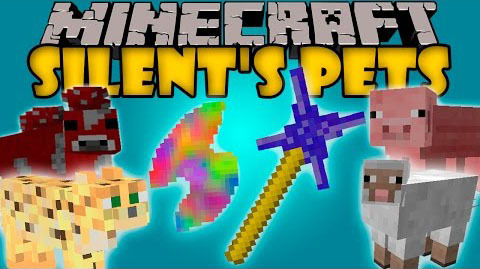 Silent’s Pets Mod surprises you by a wide variety of pets in the game. Instead of finding animals in the wild, you must craft a Pet Summon for the pet you want and use it to create your pet. The AI of all pets is more or less the same as a tamed wolf. To craft a Pet Summon, you will need eight Raw Pet Essence. You can get it by killing things. Anything is like Zombies, cows, villagers and mobs from other mods. Looting increases the drop rate. Crafting the Pet Summon you want and name it in an anvil is to give your pet a name, if you want to. Now you just right-click to create your pet (it works just like a spawn egg). Different pets have a different amount of health, attack damage, and movement speed (these different values are a bit buggy right now, they should be fixed soon). You right-click your pet to tell it to stay/follow you, and you can use any helmet on it to give it armor. The helmet gives a full suit of armor’s worth of protection. When your pet inevitably dies fighting that super tough boss or roasts itself in a fire, it has a chance of dropping a replacement Pet Summon. If your pet gets hurt, but survives, it will regenerate its health slowly over time. The Pet Wand allows you to do a few different things with your pet. It has three modes right now. Armor – Right-click a pet to see what it’s wearing, and shift right-click to remove its armor. Talk – Toggles the noises your pet makes on or off. It is useful if the constant barking is driving you bananas. Carry – Work in progress and currently does nothing. That will allow you to “pick up” the pet as an item. Basically it is a reusable name tag with one unique feature: It can be crafted with items to rename them. Like name tags, you can also click on a mob to rename it, using one point of durability. Cow – Good health and slow walking. It can be milked, just like a regular cow. Sheep – Well rounded. It can be sheared for wool. Pig – Hits harder than other pets. Chicken – Fragile and weak, but fast. Mushroom – Similar to cows. It can be milked for mushroom stew. Cat – More or less like vanilla cats, except they can be armored like the other pets and will actually help you fight. Dog – More or less like vanilla dogs, except they can be armored like the other pets.